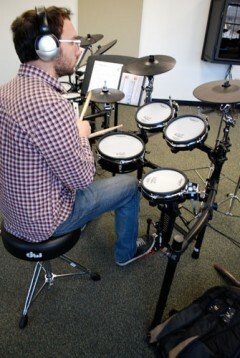 The Roland Drumlab allows for the simultaneous instruction of eight individual students while providing an unlimited variety of drumset sounds and settings. The Drumlab is equipped with Roland TD-9SX V-Drums sets, which replicate the traditional feel and sound of an acoustic set in an electronic environment, and a teaching lab conferencing system for individual instruction. In addition to being used for Popular Music courses in drumset proficiency, the Drumlab is available day and night for student practice.